In this engaging text, Arthur Kinney introduces students to Shakespeare’s plays in the context of Elizabethan and Jacobean theater. Introduces students to Shakespeare's plays in the context of Elizabethan and Jacobean theater. Focuses on the material conditions of playing and of playgoing. Covers venues, audiences, actors, society, government and regulation. 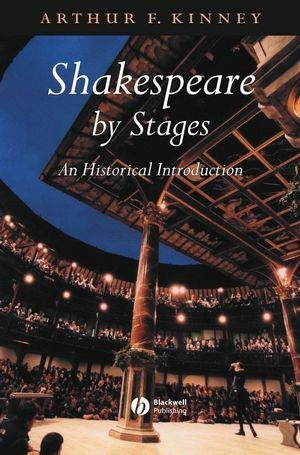 Each topic is considered in relation to a selection of Shakespeare's plays. Shows students how the plays and the context in which they were produced illuminate one another. Arthur F. Kinney is Copeland Professor of Literary History at the University of Massachusetts, Amherst and Director of the Massachusetts Center for Renaissance Studies. He is the editor of Renaissance Drama: An Anthology of Plays and Entertainments (Blackwell, 1999), A Companion to Renaissance Drama (Blackwell, 2002) and of the journal English Literary Renaissance. His other works include Elizabethan Backgrounds (Second Edition, 1994), Rogues, Vagabonds and Sturdy Beggars (Second Edition, 1995), Humanist Poetics (1986), and Lies Like Truth: Shakespeare, Macbeth, and the Cultural Moment (2001).